Tiny planets look very cool! The one below, featuring The Empire State Building was created by Above Interactive and is one of our all time favourites! What is a tiny planet? “Tiny planet” also called “little planet” is a special projection that rolls your 360 photo into a sphere that looks like a minature planet. People call this technique stereographic projection. This kind of view became quite popular and many 360 enthusiasts started using tiny planets on Instagram. If you would like to join our tiny planet community on Instagram, register on Kuula and start uploading your 360 photos. Then, create tiny planets using our Tiny Planet Editor and share your tiny planets on Instagram. Remember to tag them with #kuulapic. We regularly check our feed and feature the best shots by reposting to thousands of our followers! How to create a tiny planet? You can turn a 360 photo into a tiny planet very easily with our Tiny Planet Editor. 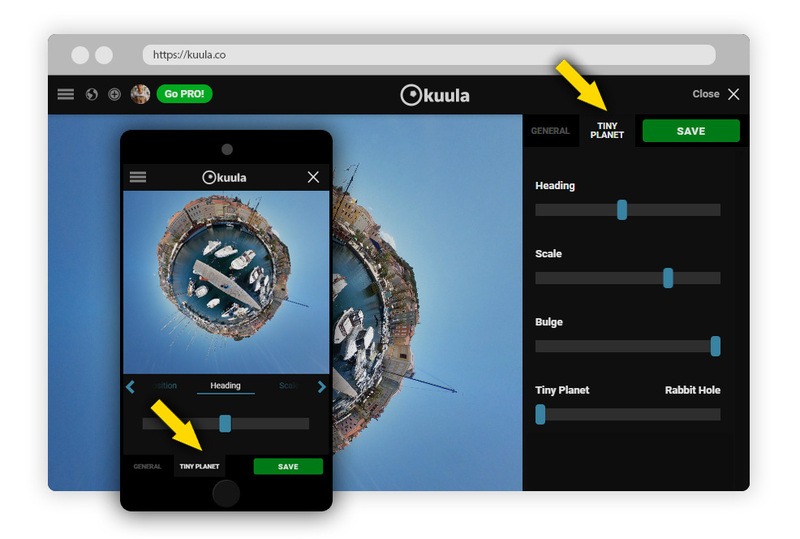 All you need to do is to upload your 360 image to Kuula, go to EDIT, choose TINY PLANET and you will be right in the Tiny Planet Editor. Then make your tiny planet look the way you want. Using sliders you can adjust the Heading, Scale (zoom), and you can add some Bulge effect to it or you can create a Rabbit Hole. Once you are happy with the way your tiny planet looks, click on the SAVE button. How to share a tiny planet? 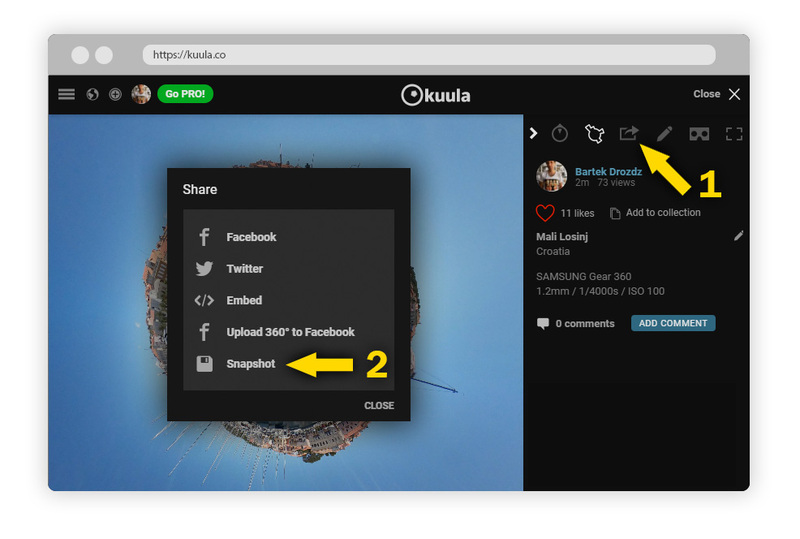 First, click on SHARE (Step 1), then choosing SNAPSHOT (Step 2) will save the image for sharing. Finally, right click the image and choose "Save Image As...". Once you saved it, you can share your tiny planet on Instagram. On desktop browsers, you can save the image in high resolution – image size of 3200 x 3200. If you’re on a mobile device, the saved image size is 1600 x 1600, but this is more than enough for Instagram – as it resizes the pictures to 1080 x 1080 pixels. Follow Kuula’s Instagram account for some inspiring tiny planets and start creating them yourself with Kuula Tiny Planet Editor! Don’t to forget to tag your posts #kuulapic when posting to Instagram for a chance to be featured.